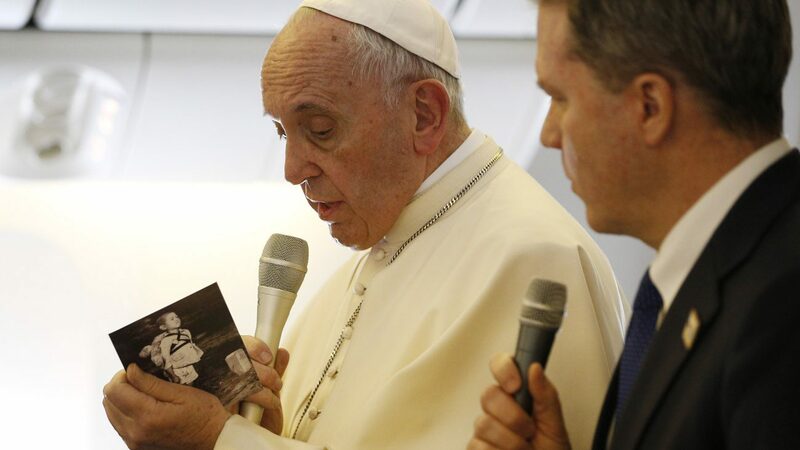 Pope Francis holds a card with a 1945 photo from the aftermath of the atomic bombing of Nagasaki, Japan, as he greets journalists aboard his flight from Rome to Santiago, Chile, Jan. 15. Also pictured is Greg Burke, Vatican spokesman, who distributed the card to all journalists aboard the flight. MEXICO CITY (CNS) — The papal flight to Chile lasted about 15 hours and flew over the Pope Francis’ native Argentina, where many in the church, politics and chattering classes wondered aloud: When will he arrive here? After Argentine Cardinal Jose Mario Bergoglio was elected pope in March 2013, many Argentines expected he would put his home country on the top of his list of countries to visit. Nearly five years later, Pope Francis has traveled four times to Latin America, but not Argentina. The pope has never announced any firm plans to visit, though church observers voice opinions that he would prefer to avoid the polarization of Argentine politics, especially because, as archbishop of Buenos Aires, he often criticized corruption and ministered to the marginalized. Politicians on all sides have tried to claim the pope as own of their own — a fellow traveler, who would embrace their cause if he were in the country. Some old friends are sometimes seen as informal spokesmen for the pope. “These so-called ‘friends of the pope’ do not help because they’re part of the ‘grieta'” — or crack, as Argentines call their political polarization — “and media, interestingly, present them as spokesmen of the Holy Father,” said Tito Garabal, a Catholic journalist in Buenos Aires, who has known Pope Francis for more than 20 years. “They’re repeating falsehoods that many people believe are true, and then it has to be said that the pope never said such things,” he added. “This constant association” — of the pope with others in Argentina — “has generated confusion and justified regrettable distortions of his figure and his words,” the statement said. “The immense majority of Argentines love Pope Francis. They do not confuse him with those who try to use him, pretend to represent him or attribute imaginary positions according to their own sectoral interests. Common people want to hear the Holy Father’s teachings and recognize it by his clear and plain language,” the statement continued. Pope Francis visits Chile and Peru from Jan. 15–21, his fourth trip to South America. Observers are split on whether he will ever visit Argentina. “I have the impression that the Argentine bishops don’t know what to say,” said Jose Maria Poirier, editor of the Catholic magazine Criterio in Buenos Aires. Garabal said the pope had other more urgent issues than returning to Argentina for a homecoming. Contributing to this story was Junno Arocho Esteves in Santiago, Chile.